From raking the last batch of autumn leaves to stringing holiday lights to moving heavy boxes of decorations, ‘tis the season when backs can take a beating. If you’re picking up boxes or moving objects never bend at the waist; instead bend your knees and let your legs, not your back, do the work. As a SOT-based practice, we do a lot of work with sacroiliac joints. Bending with the knees is going to save this joint which will lead to less dysfunction and compensation. 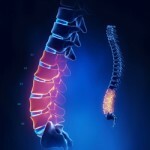 Such dysfunction and compensation can progress to other issues such as neck and upper back pain. Standing on ladders for prolonged periods also puts your body in an awkward position that can lead to neck and upper back pain. To diminish back pain after raking, lifting or other activities, it’s important to apply ice within the first 24 hours. Many people mistakenly think that you should use heat. Applying ice can calm down any inflammation and swelling that might occur due to acute pain from lifting, bending or twisting. Putting ice on the affected area also may reduce the frequency of treatment that would otherwise be required. Ice 20 minutes on with at least an hour break in between each application. Ideally, you will want to have three applications a day. Of course one of the best ways to keep your back healthy is getting regular chiropractic checkups. Book yours today.